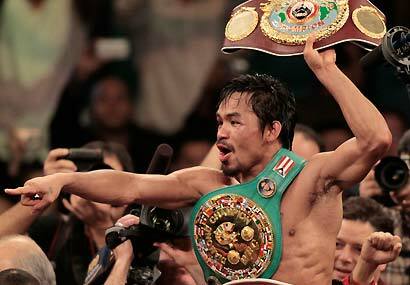 Congratulations Manny for winning a TKO on the 12th round against Miguel Cotto! That was a great fight. Boxing fans loved your fight with Cotto. You sure are an exciting fighter. And as for Cotto , you have a big heart. And now, as a boxing fan, I wanna see a Pacquiao versus Mayweather! Let the Pretty Boy fight Pacman. It will be more of a national holiday this coming November 14 in the Philippines. Filipinos, young and old, men and women will be watching the boxing fight of Manny “Pacman” Pacquiao against the Puerto Rican Miguel Cotto whether it will be through pay-per-view, on theaters, internet or even on delayed telecasts. Any fight of Manny is always being watched either from those coming from the high society in the Philippines, government officials and even the downright masses. And now this Sunday, Saturday on MGM Grand arena where the showdown will be held, Filipinos wish that Manny will prevail and that he will win against Miguel Cotto. 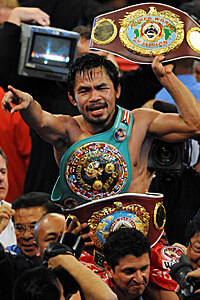 He will make the Filipinos proud if that will happen for he will be the first boxer to win seven world boxing titles. And for u Manny, let Cotto taste what you got and be the hero of the Filipinos in this very sad time. It will be better if you will knock out Cotto, but we just wish that you will win…Good luck and god bless.